A new tile - a Zendala! I had some Time To Tangle! **Important note: March offerings are available for registration online. Offerings beginning in April will be available for online registration soon. Phone registration is at (603)230-7300. 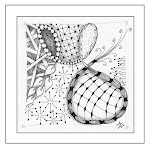 Now that you have completed Zentangle® Basics, take your tangling to new depths and heights! Learn new tangle patterns, shade for greater depth and learn how to highlight for greater expansion. Tangellations will be introduced as a simple method of how to create new and unique patterns of one’s own. Join the fun and meet others who also enjoy Zentangle! Materials include pens, pencil, shader, and tiles. All sessions are 4 Weeks and the cost is $99, including materials. (Due to upcoming price changes, students in this class will receive a $10 merchandise credit for use in class.) Sign up now! Isochor Series: Isochor, Hazen, Snail, Frondous, Keeko and Marasu. or by phone at (603) 230-7300. February 22 - A New Necklace! I kind of fell off the radar for awhile. Some angry tendons slowed down my drawing, but things are on the mend. I hope to continue to post regularly again - not every day. Tile A Day was fun while it lasted! Here is my latest, a new necklace, and my answer to the Diva's weekly challenge - tangle pattern "Quandry." I am going to attribute yesterday's missing post to having had enough of January! Here is a recent Zendala illustrating an attempt at "fungees" that went astray.